It had to happen eventually. 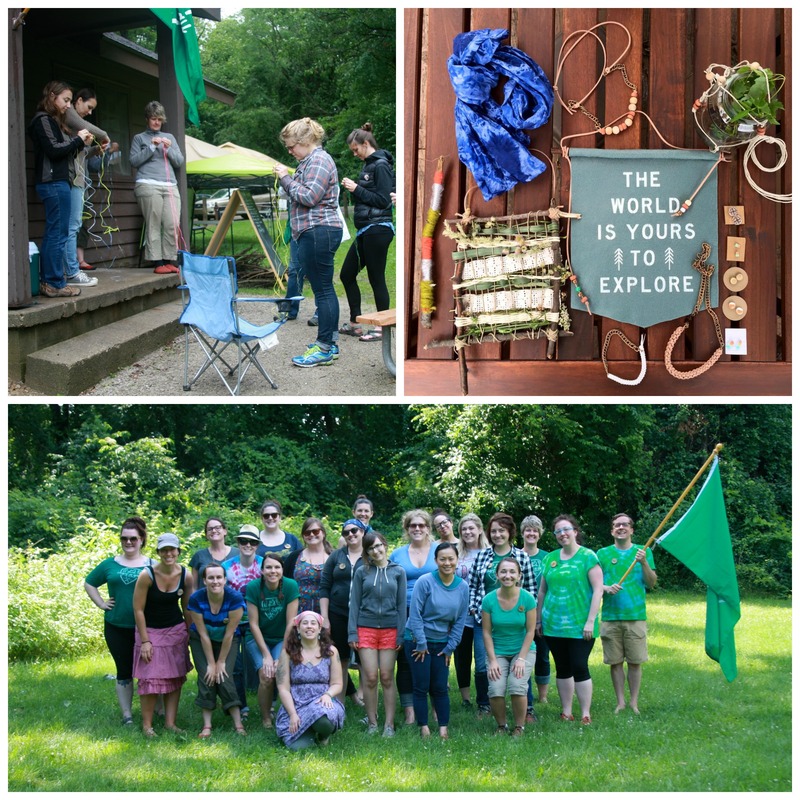 After two years of sunshine, a rainy day came to our third annual summer camp for grownups. But we soon found that at Craft-A-Way Camp, a rainy day is just another opportunity to bond with our friends and explore our creativity. The clouds soon passed, but the camaraderie and inspiration are still going strong. 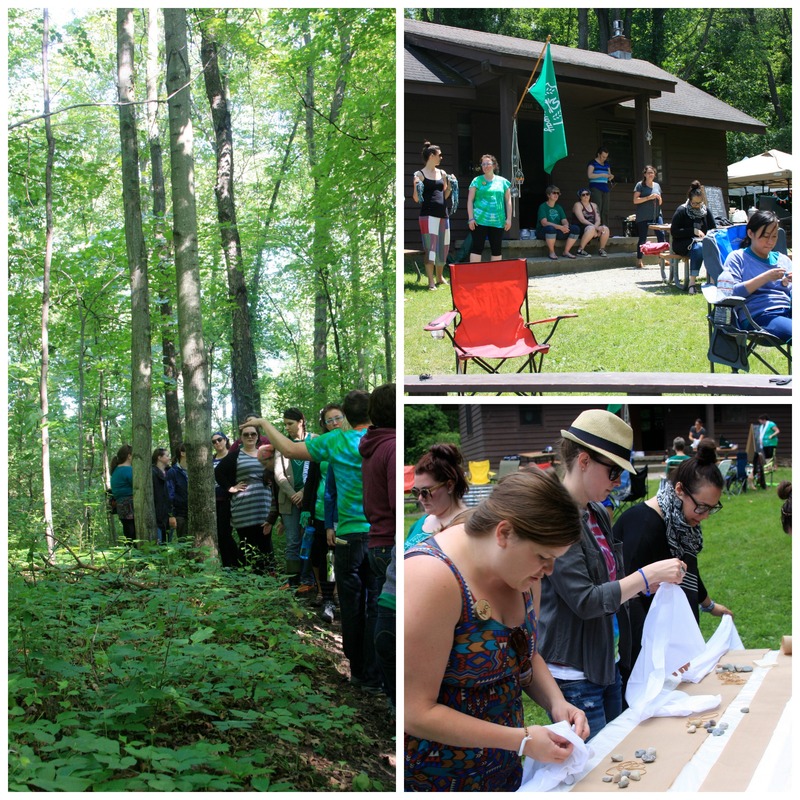 As we do each year, we gathered at Waterloo Recreation Area, on the fourth Saturday in June. 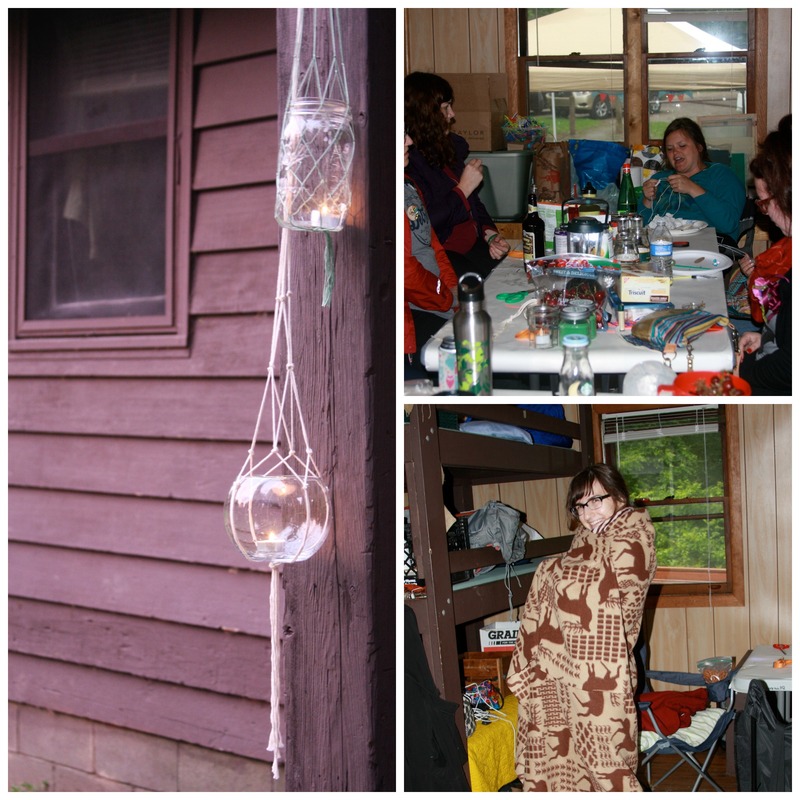 Finding gray skies over our accustomed clearing in the woods, we transformed one of our bunkhouses into a cozy little craft cabin. With snacks and coolers close at hand, and the warm hum of laughter all around, we settled in for a day of uninterrupted crafting. The gentle drumming of rain on roof was our only distraction, so we were free to focus on painting earrings, weaving lanyards, and getting to know our fellow campers. Just in time for our campfire, the skies cleared, revealing a beautiful sunset behind the trees. 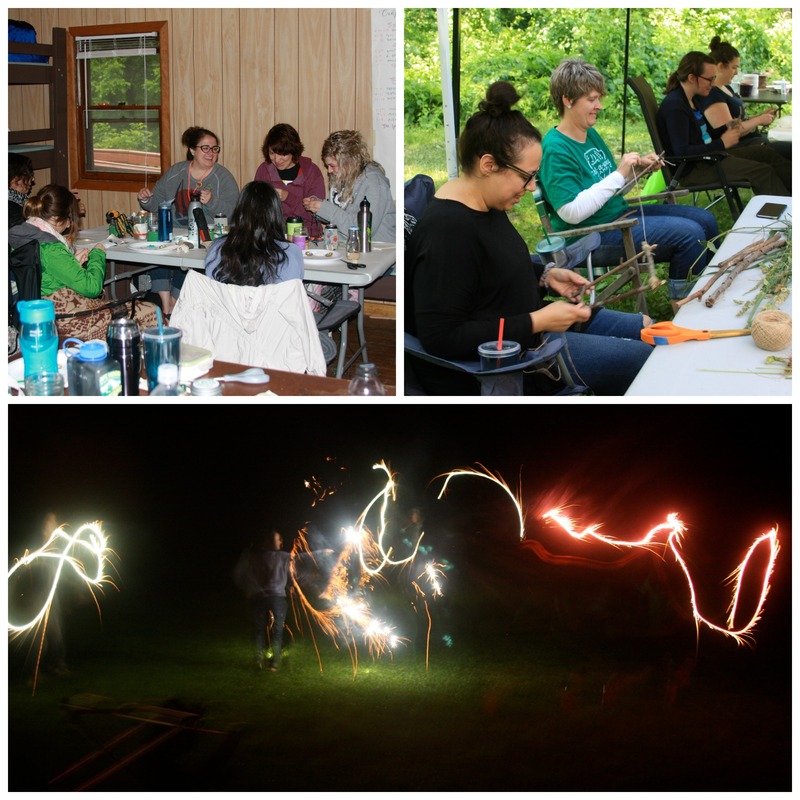 Campers emerged from the cabin, lanyards and yarn-wrapped sticks in hand, and gathered joyfully round the rising flames. Weathering the storm had brought us closer together. And because the fire had once seemed certain not to happen, its songs, s’mores, and sparklers were all the sweeter. Sunday was clear and bright, with bugs and humidity cleared from the air. It was the perfect day for a hike in the woods. And to sprawl on the lawn, sinking scarves into buckets of warm indigo. As the day reached its end, nobody wanted to leave. Campers lingered at the outdoor tables, only pausing from their handiwork to hug departing friends. As we said goodbye to Waterloo, the rain that once seemed so threatening was just another cherished memory of camp. We are grateful to all the wonderful instructors who helped make this year’s camp so special. Courtney Fischer led us in crafting many lovely pairs of earrings. 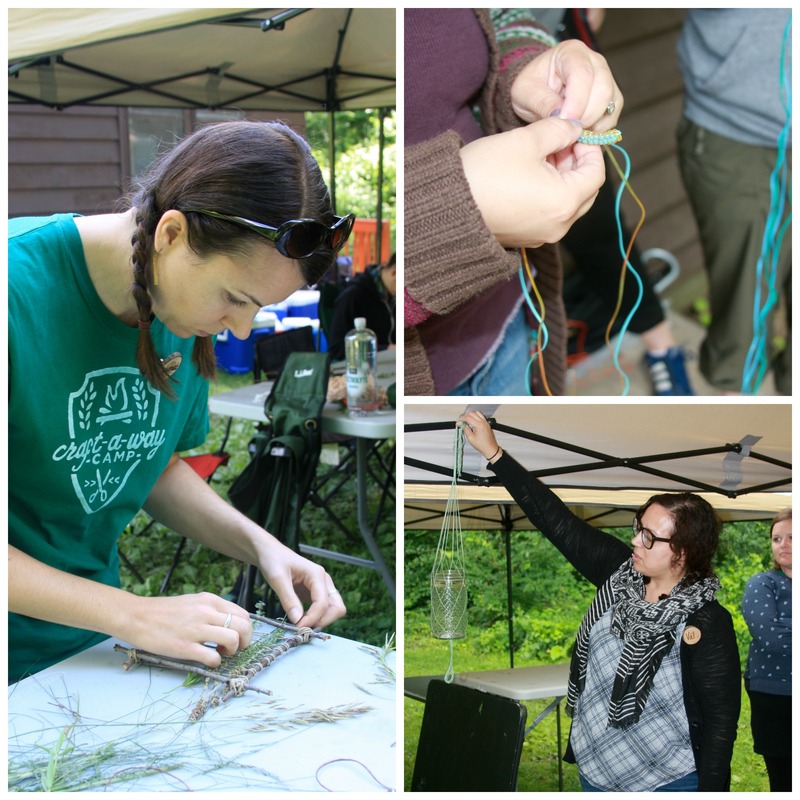 Val Willer taught us the classic craft of knotting macrame plant hangers. Marcy Davy helped us screen print inspiring felt banners, and showed us how to make lavender-scented sachet pillows. We’d also like to thank crafter, camper, and music teacher Stephanie Thompson, who brought her collection of rhythm instruments to the campfire singalong. Courtney, Val, Marcy, and Stephanie are all strong pillars of our Midwest craft community, and we appreciate their generosity in sharing their time and talents. We don’t accept sponsors at Craft-A-Way Camp. (The woods are refreshingly free from advertising, and we strive to keep them that way.) But we always enjoy collaborating with our friends, and sharing gifts with our campers. This year, Liz Drabik of Aromaholic provided us all with custom-made vegan lip balm, that tastes like a crisp IPA on a hot afternoon. Jenny Rostkowski of JKM Soy Candles made us Craft-A-Way candles, with the scent of marshmallows roasting over a campfire. Many thanks to our talented friends! These are the flavors that will carry our minds back to camp throughout the year. Last summer, just a few short weeks after camp, a flood swept through our family’s home, destroying all our handmade work, along with countless mementos from years in the craft community. It was a discouraging moment, and it caused us to pause and reconsider how much time we really wanted to spend on planning these kinds of crafty events. It also left us with a lingering terror of rainstorms. Where we once opened the windows to enjoy the soothing rumble of thunder, we now found ourselves nervously checking for signs of rising water. So when we arrived to set up for this year’s camp, and found the rain pouring down, we were scared. We feared that we were about to see the water destroy another of our most treasured creations. And when the jokes and crafts began to fill the cabin, and that familiar Craft-A-Way magic was crackling in the air, it was an important turning point. We were able to relax, and enjoy the comfort of a rainy afternoon indoors. And we were able to look forward to more crafty get-togethers in the future. 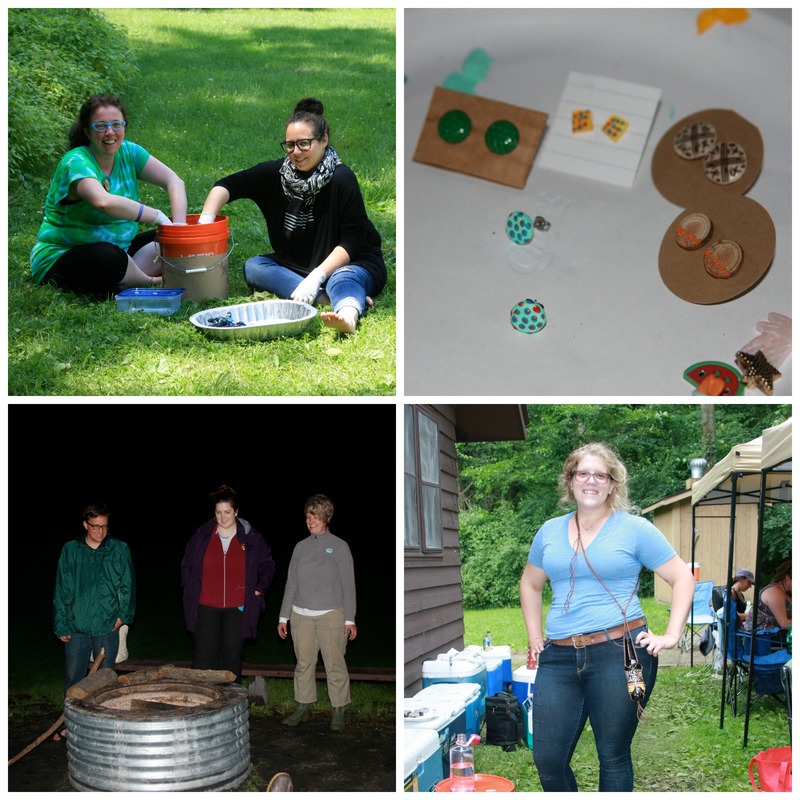 People often tell us that Craft-A-Way Camp has made a real difference in their lives. That it has rejuvenated their creativity, or helped them through a difficult time. This summer, it had that effect on us. And we will forever be grateful to the campers whose good humor and resourceful attitudes made that happen. This supportive community is the real heart of Craft-A-Way Camp, and it means more to us every year. 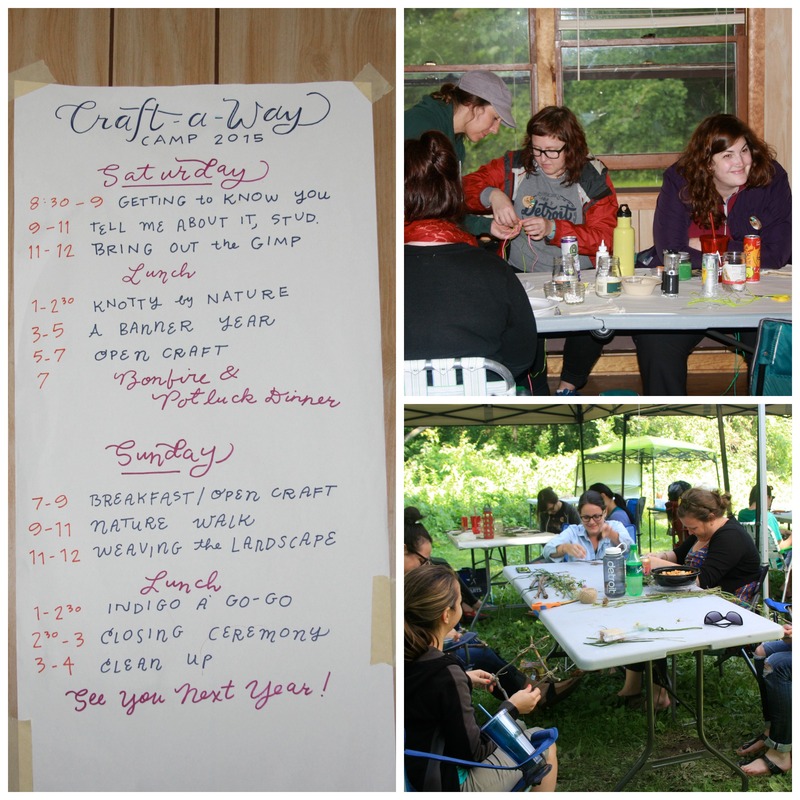 Nothing will stop Craft-A-Way Camp from returning next summer, or from bringing all its silly fun and serious magic. And when it’s back, you’ll want to be a part of it! This entry was posted in Uncategorized and tagged craft community, Craft-A-Way Camp, summer camp. Bookmark the permalink.